Among the many new faces I was privileged to meet Saturday was Mike Updegraff, Editorial Assistant for a newer publication entitled Mortise & Tenon Magazine ). More than an incredibly informative work of literature, the magazine is a work of art. Good job, guys! Here are a few photographs of John Pennings describing the work involved in hewing roofing shingles from a bolt of wood using traditional tools. Many visitors were able to try it themselves! We’re already looking forward to our next event, which will be held on Wednesday, July 4th, from 11-3. We’ll host an Independence Day Celebration with grilled hot dogs and drinks, a reading of the Declaration of Independence, a bell ringing ceremony at 2 p.m., and we’ll celebrate our artists who will participate in the annual community art exhibit, contest, and sale which runs from Friday June 29th until Sunday, July 1st). We will also try to get some hewing and shingle making in during this celebration, so please plan to join with us and be a part of building the Noah Blake cabin. 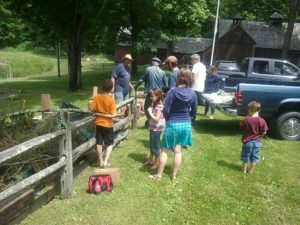 Saturday, May 12, 2018 Make a Trug with Joe Brien, Two Sessions 1:00 PM – 2 and 2:00 PM – 3:00 PM. Children will hand craft a trug, or garden basket, to be used for harvesting, foraging and collecting. Ten person limit, $10 per student. Best for kids 6 and up, accompanied by an adult. *Please call or email to reserve your spot. Saturday, June 9, 2018 Connecticut Open House, Free Admission. 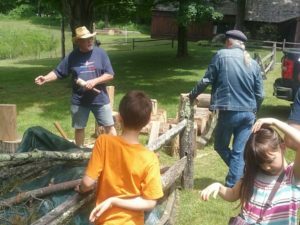 Hewing & shingle making with Friends members on the grounds of the Eric Sloane Museum, 11-3 p.m.
Sunday, June 17, 2018 Make a Back Scratcher (a 20 minute project) with Joe Brien, from 1:00 PM to 3:00 PM. Just stop in to fashion a back scratcher using real hand tools. Perfect for Father’s Day! Best for kids 6 and up, accompanied by an adult. No extra charge for this activity. Friday, June 22 – Monday June 25 Accepting Artwork for Community Art Exhibit, Show, and Sale. Theme this year: Noah Blake and his Wonderful Cabin. Up to three pieces of artwork connected to the Noah Blake cabin and story, Diary of an Early American Boy. Art will be accepted from 10:00 AM to 3:00 PM. Friday, 6/29 – Sunday, 7/1 Community Art Exhibit, Sale and Contest – Visitors vote for Best In Showin three categories. Wednesday, July 4, 2018 Independence Day Celebration. Reading of the Declaration of Independence, Bell Ringing at 2:00 PM, Artists Reception for those artists who participated in the Community Art Exhibit, Show, and Sale. (11 a.m. – 1 p.m.). 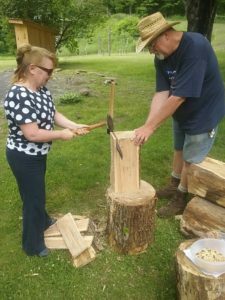 Hewing & shingle making with Friends members on the grounds of the Eric Sloane Museum, 11-3 p.m.
Saturday, August 4, 2018 Build a Tool Box with Joe Brien. Two sessions: 1:00 PM – 2:00 PM and 2:00 to 3:00 PM. Learn how to safely use hand tools to craft your very own wooden tool box for woodworking tools, art & craft supplies, garden tools and collectibles. Best for kids 6 and up, accompanied by an adult. Ten person limit, $10 per student. *Please call or email to reserve your spot. Saturday, August 18, 2018 Make a Paddle Boat (a 20 minute project) with Joe Brien, from 1:00 PM to 3:00 PM. Just stop in and build and race your very own, high performance, rubber band-powered paddle boat! Great fun for the whole family! Best for kids 6 and up, accompanied by an adult. No extra charge for this activity. Saturday, October 6, 2018 Whittle a Spoon with Joe Brien, from 10:00 AM to 2:00 PM. Learn how to whittle a spoon with a knife and hollow the scoop of the spoon using an ember from the campfire. Lunch Included! The group will prepare soup on the campfire and eat it with your new spoons! Best for kids 10 and up, accompanied by an adult. Limit 15. $20 per student. *Please call or email to reserve your spot. Sunday, October 28, 2018 Museum Closes for the Season. 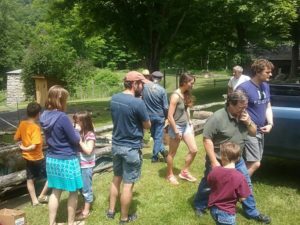 Volunteer to work on Eric Sloane’s Noah Blake Cabin! June 4, 2018 | by Wil | Comments Off on Volunteer to work on Eric Sloane’s Noah Blake Cabin! Looking forward to spending time with volunteers this Saturday, June 9th, on the grounds of the Eric Sloane Museum. We’re interested with connecting with you if you have a desire to learn or to hone skills in hewing logs and splitting shingles. This Saturday, we will be working on the post and beams, as well as the shingles, for Noah’s room in the Noah Blake cabin.